Said to have once hung on the neck of the Sun God himself, the large and mediocre Koh-i-Nur ("Mountain of Light") diamond was given as a gift to Queen Victoria in 1876, as a symbol of her sovereignty over India. Allegedly found in the Indian diamond mines of Golconda, the diamond has an obscure and largely undocumented history. 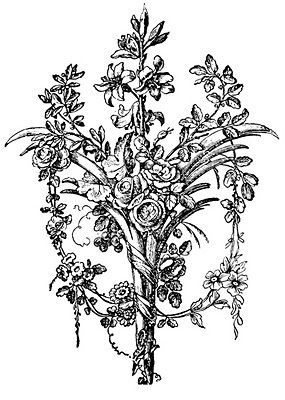 Having spent an unknown number of centuries in the hands of the Mughals, possibly even housed secretly in the great Peacock Throne, the diamond was seized in 1739, by Nadir Shah of Persia. It remained in Afghanistan, passing through the hands of several Persian rulers, until Shah Shuja was defeated by Mahmud. From prison, Shah Shuja sent the stone with his family to Punjab, where they found sanctuary. 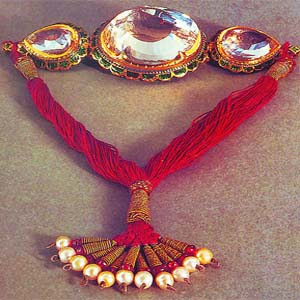 Shah Shuja’s wife, Queen Wafa Begum, secured her husband’s release from prison by gifting the large jewel to Ranjit Singh, who hired a jeweler to facet and set into an armlet. He had hoped that the new cuts would release the radiance he believed existed within the stone. However, the diamond remained hopelessly devoid of brilliance. Greatly disappointed, Ranjit Singh beheaded the jeweler responsible for faceting and setting it. After his death in 1843, Ranjit Singh left a vacuum of power in India. This, of course, resulted in fighting among his successors, one of whom was nine-year-old Duleep Singh. It also opened the door for Britain to finally gain a foothold in the sought-after Indian territory. After a six-year attempt to dominate the region, the British defeated the Sikhs and Afghans, abdicated the Sikh treasury under the 1849 Treaty of Lahore, and carried the Koh-i-Nur (also called Koh-i-Noor) and Duleep Singh back to England in victory. Queen Victoria’s guilty conscience and propensity to the misfortunate under her wing inspired her to convert Duleep Singh to her brand of Christianity in 1854 and take him in as an honorary member of her household. Smitten by his charm and infallible manners, she looked after him under what can only be called a Christian duty that compelled her to prevent (control) him from reverting back to his old barbarian ways. Duleep Singh enjoyed an allowance paid by the state. He accompanied Victoria and Albert on many family trips and played with the royal children frequently. He and Prince Albert, who dabbled in photography, spent many hours together developing pictures in the castle dark room. Always one for sentimentality, Queen Victoria had a portrait of him commissioned, and he returned the favor by wearing a miniature of his beloved queen around his neck. Despite her ministrations and affections, Duleep did indeed return to his former “barbarian” ways. He suffered a severe bout of mental illness in the 1880s, replete with delusions of reclaiming his seat of power in India. These unfortunate delusions prompted him to travel to Russia, where he allied himself with some nefarious characters in an attempt to start an Anglo-Russian war. Of course, Victoria was absolutely furious and considered his actions a serious betrayal of her trust and affection for him. 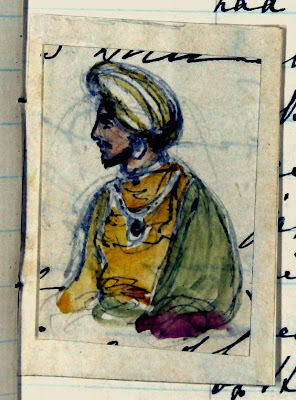 After a serious stroke during a visit to Paris, Duleep Singh wrote a repentant letter to the queen in hopes of being allowed to return to England. Though she convinced Parliament to grant his request, he was too ill to travel. He spent his final days in Paris, bitter and partially paralyzed. He did secure a final meeting with the queen two years before he died. She agreed to meet him at her hotel on the Riviera while she was on holiday. Duleep spent their entire time together regaling her with all of his misfortune and woe. Queen Victoria was said to have been glad for the opportunity to forgive him, but she was clearly distressed by the meeting. Throughout her reign, the Koh-i-Noor diamond remained a source of both pride and guilt for Queen Victoria. She did wear it for her son, Prince Arthur's, wedding in 1879; however, she was known to avoid any appearance of flaunting the jewel. She felt a deep sense of chagrin at conquering the Indian territories, and I’m sure her affection for Duleep played a role in her restraint in wearing the gem. 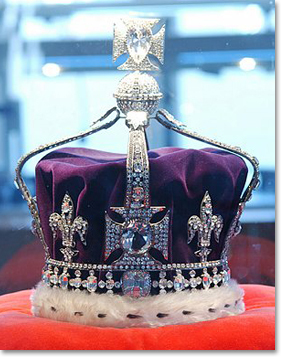 Although there have been campaigns lodged by the Sikhs for the return of the “Mountain of Light” to its country of origin, the Koh-i-Noor diamond remains a part of the British Crown Jewels and is kept in the Tower of London. 1. Rappaport, Helen. Queen Victoria: A Biographical Companion. Santa Barbara: ABC-CLIO, 2003. 2. All About Gemstones. "Diamond Mines of the World: India's Diamonds of Golconda." Accessed August 6, 2012. http://www.allaboutgemstones.com/diamond_mines_golconda.html. I'm so sorry to leave you hanging. I finished the series, but I never linked part two up with this one. I corrected the link and will send it to you in an email! I have now combined all the posts into one longer read. I hope this makes it easier for those reading after you. Did the Syamantaka Mani Become the Hope Diamond? Where is the Syamantaka Mani Today?